Okay. I am going to admit it. I am just obsessed with tablescapes lately! 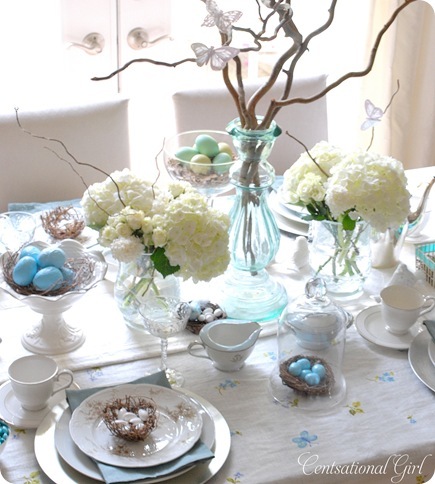 Tablescapes, vignettes, setting a table, decorating a table, centerpieces. I just can’t seem to get enough!! Did you know that the word ‘tablescape’ is not even a word in the dictionary? Even Microsoft’s Word says that the word does not exist. I think that they need to get with the program! I took out a few of my little accessories to see if I could use any of that first. What was I thinking dragging all this stuff out! Then I just played with putting accessories in the middle of table until I liked the look. I did not want to put silverware out but if you are looking for a guide on how to set a proper table, Solutions , an online and catalog store that sells ‘products that make life easier,’ offers a detailed article here. I thought it was fun to do! And I get to smile every time I walk by. Even my husband, who does not care much about decorating, keeps saying how nice it looks. Yay! I can tell this might be a new hobby for me! Don’t you just love it? I saw him from across the store- knew I had to have him right now! I love finding those special items that make me happy. Comments? Do you like to decorate your tables? I would love you to send pictures of your tablescapes to share!